I selected sizes Small & Extra Large Yo Yo Makers. This afternoon I sat and made most of these. The yo yo maker comes in 2 pieces, the plate and the disk. I snapped the small size apart to show you. Easy peasy to make yo yos this way. The fabrics in the background are Cottage Rose by Alex Anderson for P & B Textiles and Fruit Basket by Robert Kaufman. We're having a heat wave here in NY today. Temperatures in the 30s and 40s. Back to snow and rain tonight. 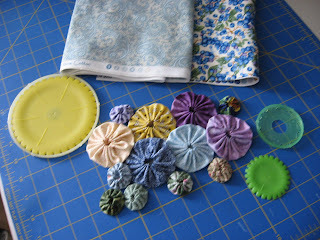 The other day I read a tip in one of my quilting magazines that I have to implement. The writer told us she buys a lot of rulers. Because the instructions often get lost, she makes a copy of the instructions and put them in a notebook. She keeps the original with the ruler.